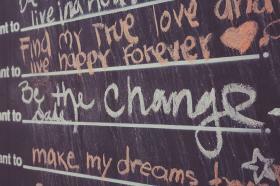 Candy Chang’s “Before I die…” wall turned an eyesore into art. Photo by Tony Webster [CC BY 2.0], via Wikimedia Commons. With permission from the town and her neighbors, Chang turned the eyesore into a work of art. She covered one side of the house with chalkboard paint. Then, she stenciled a few words on the wall approximately 80 times. The stencil read, “Before I die I want to _____________________.” She put a bucket of chalk near the wall. Before the wall was finished people were stopping by, asking if they could write on it. She reported on the TED Radio Hour that one of the first people to finish the sentence was dressed as a pirate, as people in New Orleans are wont to do. He finished the sentence, “Before I die I want to be tried for piracy.” In her TED Talk, she reads some other things people wrote on the wall. After playing that clip from her TED Talk, host of the TED Radio Hour Guy Raz, explained, “The power of the ‘Before I die…’ wall is that it actually didn’t make people think about death so much as it made them think about life.” When Chang posted a few photos of the wall online, she was surprised how quickly the idea spread. “My inbox blew up with messages from people around the world who wanted to make a wall with their community.” Today there are more than 1,000 “Before I die…” walls in cities all over the world. Asked about their death, people talked about life, real life, exciting things they would like to do with their lives. People focused on things of life that really matter. In the interview Raz asks Chang what she has learned about death. “I think that contemplating it can lead to a lot of great things,” she says. What a great image for reflection during Lent. Contemplating death can lead to a lot of great things. Jesus taught this to his disciples as he contemplated his own death. Preparing his disciples for his glorification, Jesus says, “Unless a grain of wheat falls into the earth and dies, it can only be a single seed. But if it dies, it bears much fruit” (John 12:24 CEB). Life, real life, abundant life, comes when we are willing to die to self. 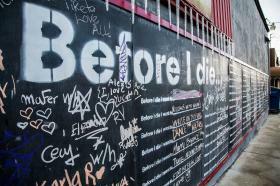 The power of the “Before I die” wall is that it makes people think about life. Photo by Tony Webster [CC BY 2.0], via Wikimedia Commons. Later in her interview with Guy Raz, Candy Chang expounds on the thought. “Contemplating death really clarifies my life and regularly contemplating death,” she continues, “has been a really powerful tool for me to restore perspective and remember the things that make my life meaningful to me.” In a lot of ways, that is exactly what this season of Lent is all about. A time to restore perspective and remember the things that make life meaningful. And so we fast. We give up chocolate or Starbucks or soda, not just to do it. Not to prove anything to anyone or to impress God. We give it up to remind ourselves that those things don’t really matter. Our life in Christ does. We worship on Ash Wednesday reflecting on our sin, asking forgiveness, and seeking to live a new life free from it. We don’t do this for a front row ticket to heaven, but because we know we have short-changed life by living our own way rather than God’s. We receive ashes on the first day of Lent with the words, “Remember that you are dust, and to dust you shall return.” We remember our mortality, not to be morbid, but to remember to live for God now, because our life is a precious gift that we should live to the full. Like Candy Chang, we struggle in daily life to maintain a perspective on what gives our lives meaning. “It’s easy to get caught up in the day-to-day and forget what really matters to you.” Lent invites us to remember what gives our lives life. During these 40 days, how will you restore perspective and remember the gifts you’ve received from the Lord Jesus Christ that make life full and meaningful? Then maybe you’ll be ready to truly live. Before I die, I want to _______. Think about it. *Joe Iovino works for UMC.org at United Methodist Communications. Contact him by email or at 615-312-3733. This story was first published on February 10, 2016.